Colored ice blocks at Harbin’s Ice Lantern Festival 2005. 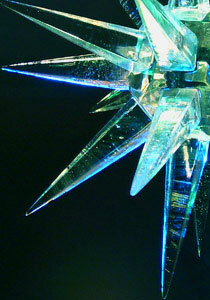 Ice is a reflective medium, appealing for its transparent and reflective qualities. It glints like crystal. It is in flux. It is clear, bubbly or white, blue, foggy or crackled depending on its environment, what minerals are in it, where it was harvested, and what happened to it as it was being formed. It is not in a fixed state. In order to freeze into crystal clear ice the water must be moving, or aerated. This happens naturally with lake ice, but this movement must be artificially provided when ice is manufactured. The qualities of ice change as it is forming and even as it is being sculpted. Temperatures effect ice. The warmer it is the more “butter like,” and faster it is to carve. The colder it is, the harder, and more brittle it becomes. Fluctuations of temperature from sub-zero nights to sunny days can create problems of melting, breaking and cracking of ice art. So outdoor sculptures must be protected under tents or behind tarps as they are being carved. The World ice Art Championships have access to some ice harvested from local lakes, referred to as “The Arctic Diamond,” and it is some world’s best quality ice. It is very clear and blue. Sediments in water obstruct the formation of crystals and create ice that is not clear. The longer the path that light is able to travel through the ice, the more blue it will appear. (USGS). Another form of ice is “white ice,” caused by an occurrence of bubbles within the ice. Bubbles increase the scattering of all wave lengths of light. “Colored ice,” is ice into which colored dyes have been added while the ice was freezing. White pigment can be added to create a marble-like and non-transparent white ice. Usually colored ice is not allowed in competitive carving, but is often seen in indoor exhibition carving and at the Harbin Ice Festival in China.